Key West - Need a ride? Key West - Awaiting Arrival of grandkids! All good things must eventually come to an end and today is the last day we're in Key West. It was also the day we paid a second visit to the Truman Medical Center and Dr. Gerth. He said Ann had made great progress, had good color back and the pneumonia was lessening in her right lung. The bad news is that it's not gone completely but she's making progress. With that report, we'll head out Thursday morning for Newfound Harbor for Thursday night and then on to Marathon on Friday. We'll spend at least a week there, maybe longer. We'd like for Ann to completely recover before leaving Marathon but Dr. Gerth said that it may take four to six weeks for Ann to get all the way back to her old self. That's not so wonderful news but at least she's getting better. So I spent the day getting the boat ready for our trip east. I added water to the tanks, did a pump out, made a trip to the grocery store for needed provisions and otherwise did boat stuff. We'll shove off around 8:00 or so and also will see what the engine temperature settles at for the first good test after the elbow replacement. So there's lots of nervous energy here with the health situation, hopefully, everything will work out. 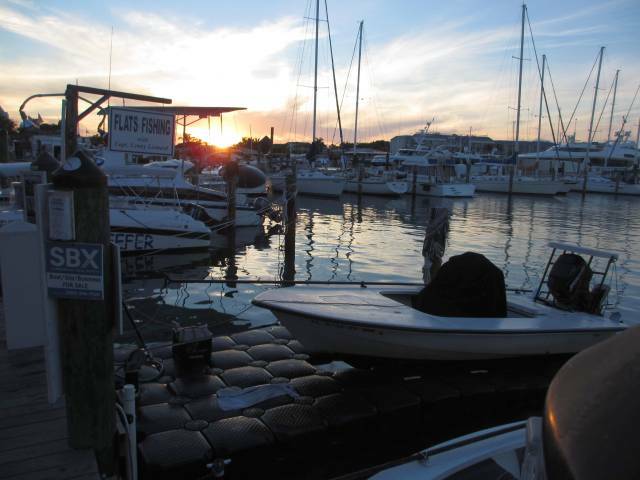 One of the reasons we chose Key West Bight Marina instead of one at Garrison Bight or even further away is the closeness of Duval Street and the nearby stores. I already mentioned Faustos's food market which is only two blocks down and three blocks over from our slip but there are also other very handy stores. There is no WalMart in Key West, the nearest one is in Miami, a serious oversight I think of WalMart marketing. There is a Home Depot and Kmart along with the major brands of supermarkets (Albersons, Winn-Dixie, Publix, etc.) but you have to take the bus to get there although it's only 50 cents each way, you'll kill and hour doing it. 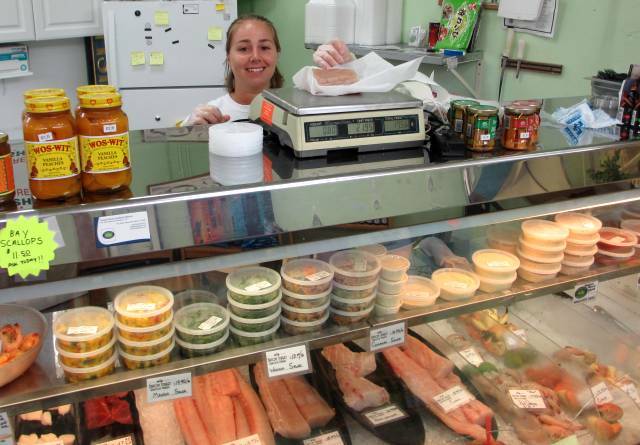 Within walking distance there's Fautos's for food and West Marine only one block away. 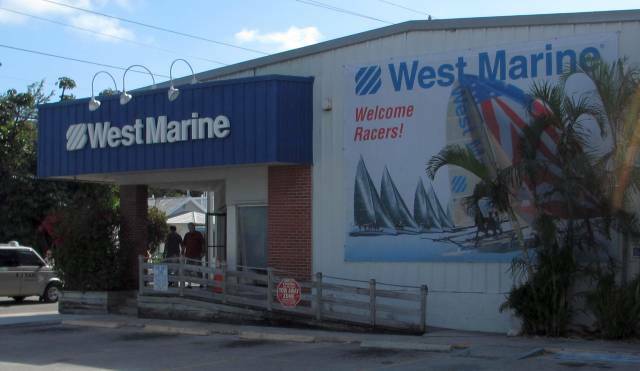 The West Marine store is a full sized store, stocking everything you would expect. 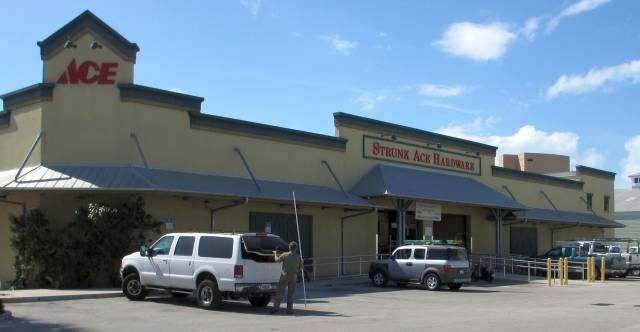 If you're looking for hardware, there's the Strunk Ace Hardware store just three blocks away. Between West Marine and Strunks, you can find just about anything. If they don't have it, they will order it - but mostly likely they will have what you want in stock. 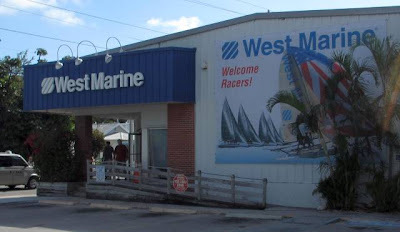 Additionally, by staying at Key West Bight Marina, you can order anything over the Internet and have it delivered right to the marina. When I ordered the exhaust elbow, it came the next day (next day delivery charge was $32 for the $500 part). So, there's plenty of things to spend money one down here and I didn't even mention eating out. If you want to eat cheap (but good) you can always get sandwiches at the Cuban Coffee Queen. Tonight I had the Hot Roast Beef with Cheese and Ann had the Key West Chicken Salad, both on Cuban bread. Total cost $12.50. If we had chosen the Cuban Mix sandwiches, the total cost would have been $12.00. The reason for eating cheap tonight is the debilitating effect of the antibiotics on Ann. She's really feeling punk so we're not very active now. We're eagerly awaiting our return visit to the doctor on Wednesday to hopefully get a clean bill of health (or at least recovering on schedule) so we can leave Thursday for points east. Wish us luck. 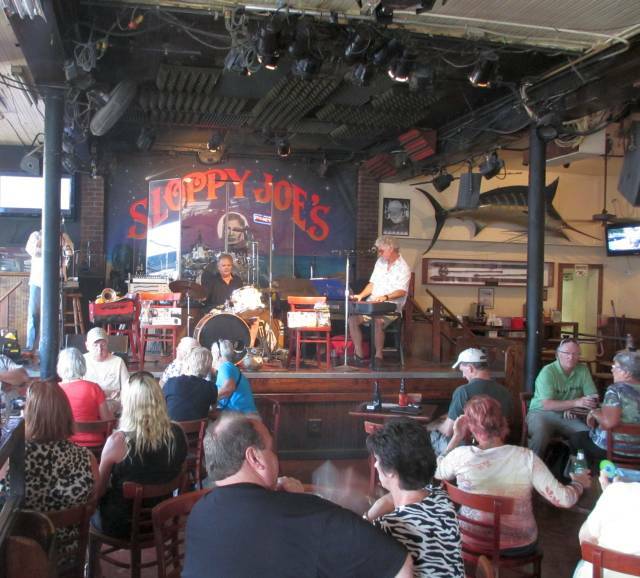 As you might imagine, there's lots of seafood places in Key West. One place in particular seems to have their own lobster boat comes ashore right in front of their restaurant! 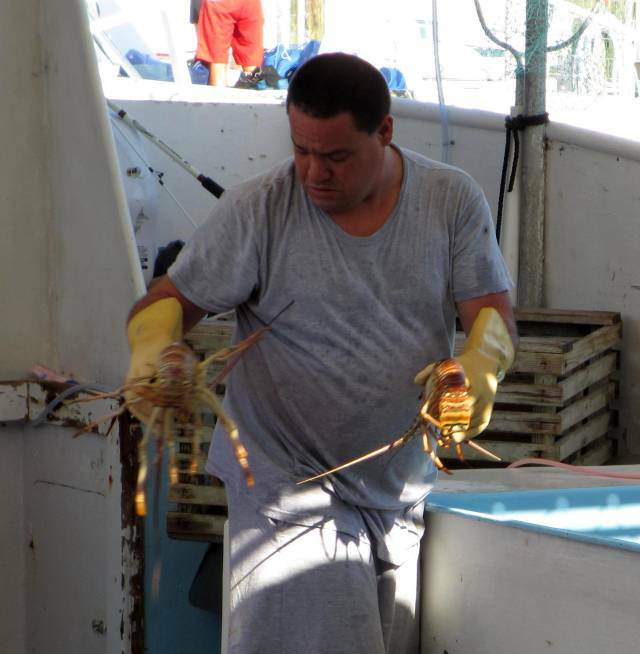 You can stand and watch the lobsters being sorted for size and placed into crates for shipment to nearby restaurants. 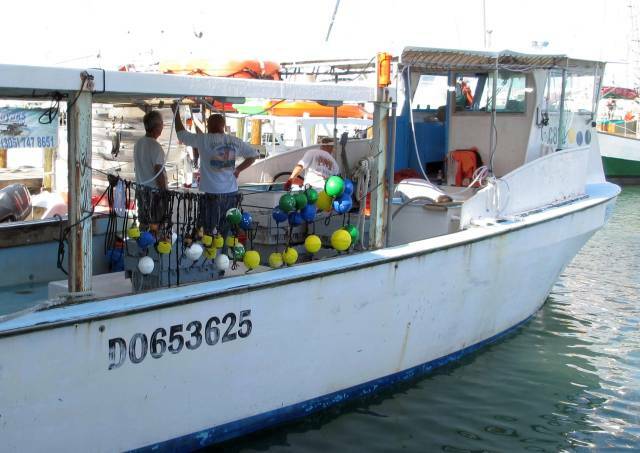 The lobster boat is in addition to the fishing fleet that goes out everyday. There's lots of fish to be had and the Key West Bight Harbor is the smaller of the two major harbors for the city. The other one, Garrison Bight, has a much larger fleet ready for charter. It's an interesting area, always something going on. 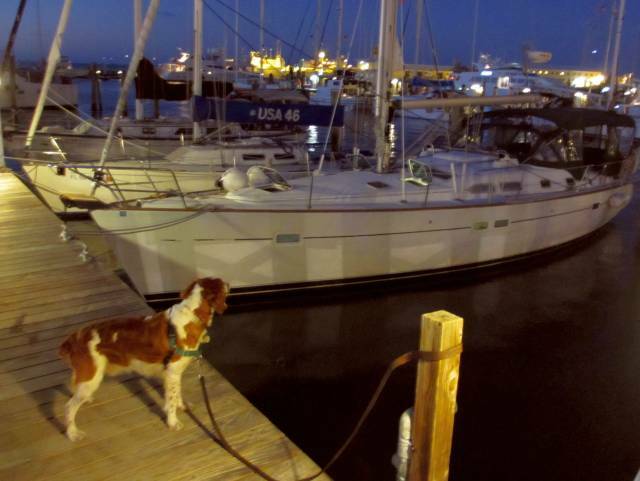 We usually walk Hoolie around 7:00 for his last outing of the day and that's just about when all the sunset windjammer cruises come back to dock. We get lots of oohs and aahs on Hoolie, Everyone wants to pet him. Of course, there's many dogs aroung too, all sizes and types and Hoolie is interested in every single one! He hasn't yet learned to control himself around other dogs, he's okay otherwise but other dogs are just too big an attraction. Key West is really heating up, over 80 today, even with winds of 20 kts. We've had no rain for two weeks and the crowds continue to build. We're still recovering, counting the days until we leave on Thursday. There's a new boat on the dock this year that has a glass bottom but with a difference. 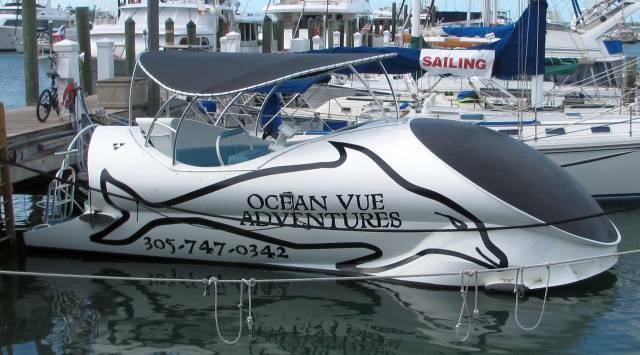 The boat is named "Ocean Vue Adventures". 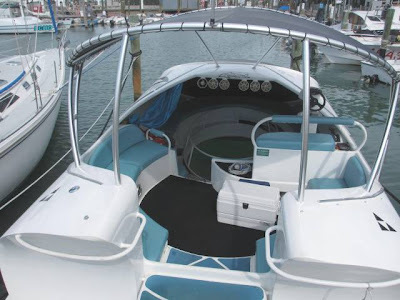 The glass bottom is enclosed in a light proof chamber so you can see beneath the boat without light interference. As and added advantage, it also has a ring of high powered lights around the glass bottom so it could be used at night. To further enhance the uniqueness of the boat, it also has hydrofoils for high speed transit to the reefs and back. 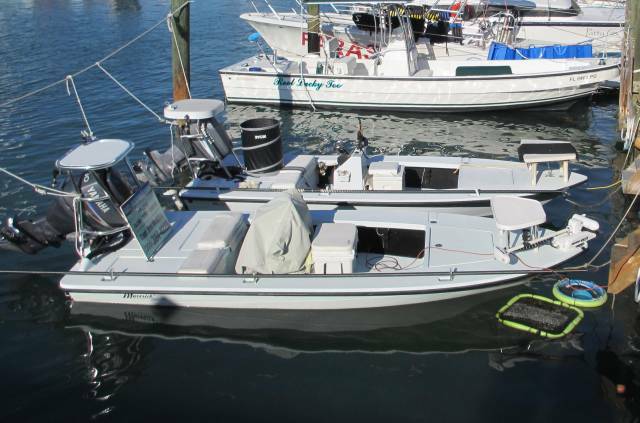 Unfortunately, the boat is not yet ready for Key West, it has a number of things needed to bring it up to Key West inspection standards. 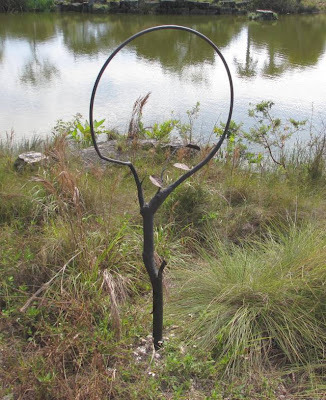 It seems like a great idea for those who can't snorkel and especially those who may be interested in night snorkeling but are concerned about entering the water at night. It would be interesting to see how affected some of the passengers would be on a less than flat ocean day down inside the boat, enclosed, looking down at the glass bottom with no view of the ocean to steady yourself. 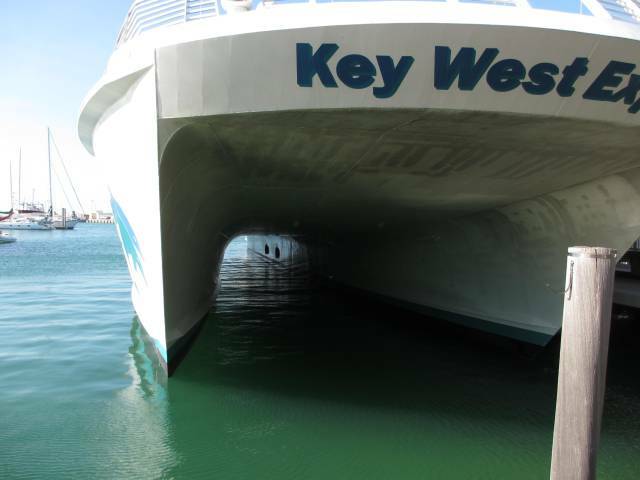 When we've been in Key West for any length of time, the bottom of the boat needs to be scrubbed. 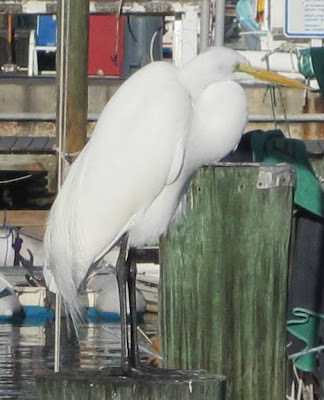 There's no current in the Key West Bight Harbor to clean the bottom naturally since the ablative bottom paint requires some flow of water to renew its surface. 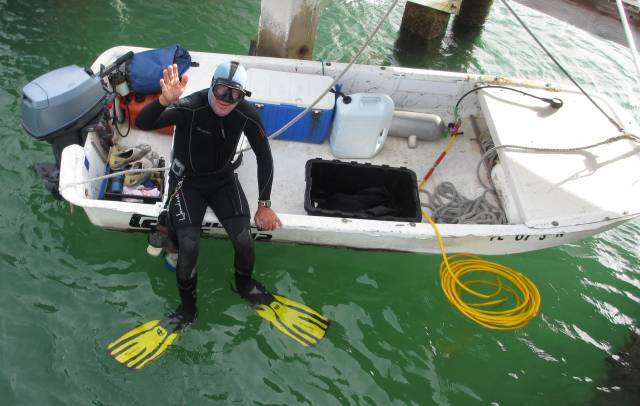 The solution used by all in the marina is a diver to manually remove bottom growth. We usually have it done the last week just before we leave so today was close enough since we plan on leaving Thursday for Newfound Harbor pending a good report on Ann from our scheduled doctor's visit on Wednesday. As far as that goes, it was just another day of recovery, nothing dramatic but gradual improvement nevertheless. The forecast for the next 10 days has the same high, 79, day in and day out. The chance of rain may vary some, from 10% to 30% but we've had no rain since Sunday two weeks ago. However, we're not out in it since we continue in recovery mode. Both Ann and I are getting better, thank goodness. I walked to the grocery store about three blocks away for interim provisions and it was apparent everything is in bloom around here. Some of the houses go out of their way to plant trees that flower, very beautiful. On the way back I stopped by Eaton Fish Market for fresh Wahoo which we had tonight. It's a local fish just caught yesterday. Ann wasn't up to anything fancy so it was pan seared with some sauce we had. If a fish is fresh, you don't need much with it. Eaton Fish Market - Nice store! Thanks to everyone who wrote to express their concerns over Ann. She is doing better and we have a second appointment with the same doctor this coming Wednesday for a follow up. Given that she gets a good review, we'll head out for Newfound Harbor the next day, Thursday, 3/1 to start our long trip back north. 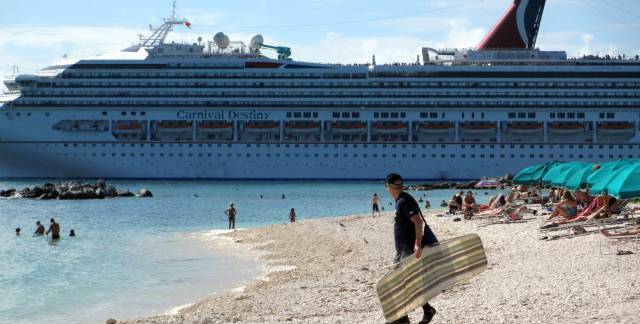 There are times when medical attention is needed so where do you go when cruising? You have a family doctor back home but there's no one familiar where you're at. We've used urgent care centers in the past and have found them to be excellent, somewhat to our surprise. You don't need an appointment and they accept all insurance providers. Today we had need of one. Both of us had developed colds going into coughs but Ann's became more severe. We called a taxi for the Truman Medical Center and signed in, filling out detailed forms on our past medical history. Dr. Gerth saw us and asked very detailed questions, explaining in even greater detail what he thought the problem was and the reasons for his conclusions after he did a few tests including a chest X-ray. 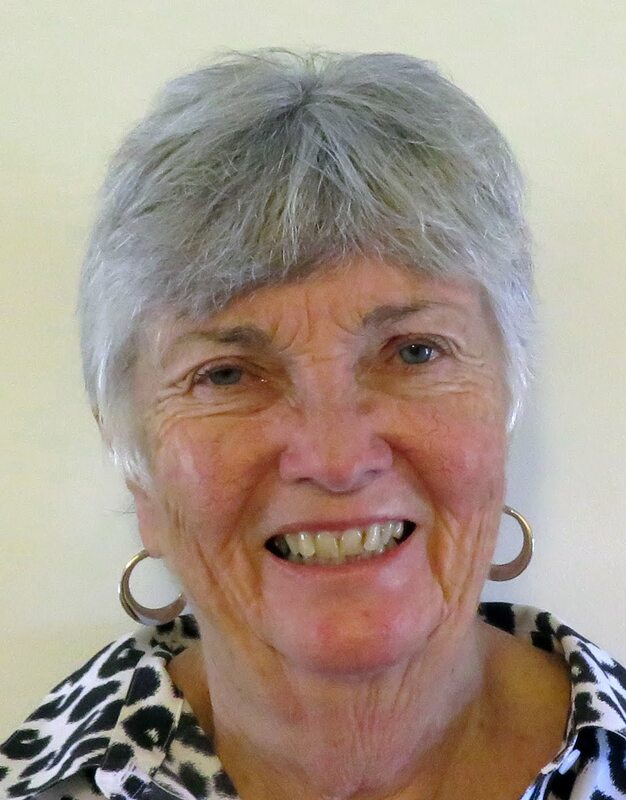 Ann has a mild case of pneumonia from the cold and is now being treated for the condition. We are both on antibiotics and medication to allow sleeping at night without being awaken by coughing. I wish the doctor we had at home would be so thorough and take the time to explain everything - perhaps they are too rushed. We received personal attention at the Center. In short, we've been very happy with the service we've received from all of the several urgent care centers we've visited over the course of our cruising these past two years. Meanwhile, we're are entering serious recovery mode with very little outside contact. It's rest and recuperation for us! We certainly want to get this taken care of before we leave for points north, especially when several of the stops along the way will be at anchorages without ready access to medical help. Still, what better place for recovery than Key West! There's a couple of places everybody goes to when in Key West but since we've been incapacitated I took a walk to take a look instead of a night out. 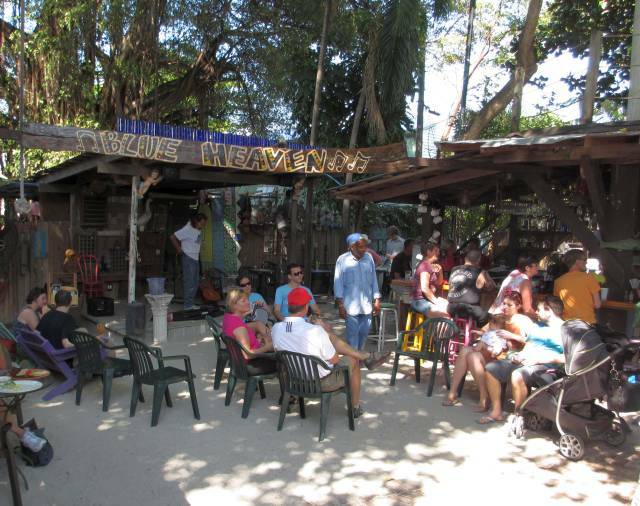 The first place is the Blue Heaven Restaurant in Bahama Village, a section of Key West further downtown. It's somewhat like Schooner's with the easting area outdoors with a sandy base (no floor). There's little coverage from the elements so it's not wise to go on a rainy day. It's also heavily wooded with many trees so there's no problem with sun exposure. Even so, the prices for dinner are rather high, even for Key West but lunch is more in line with the rest of the town. It's the ambiance that attracts the crowd. 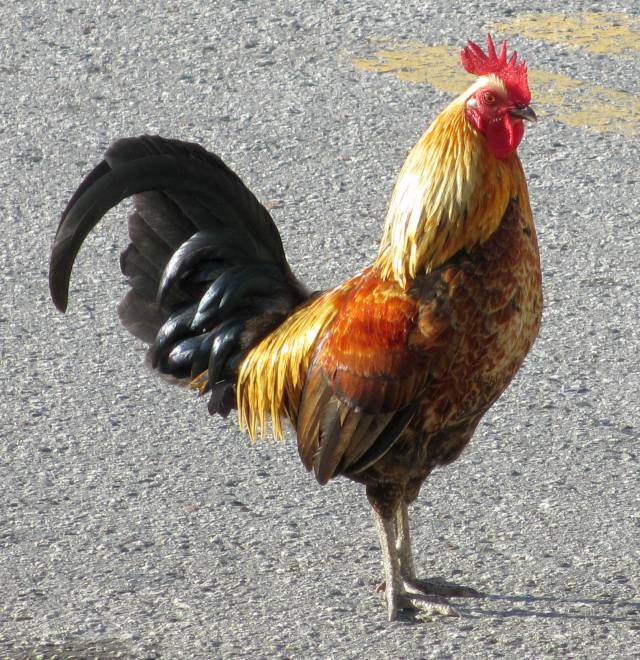 If you have breakfast there, expect roosters to keep you company and provide some background music. They seem to be around at all hours. The second must see place it Sloopy Joe's. 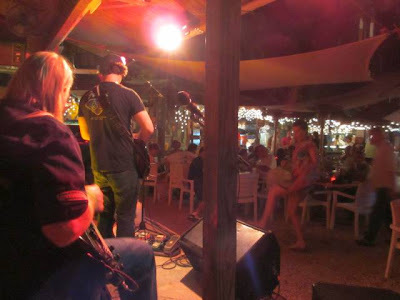 They have constant live music at all hours and the place is always packed. I dropped by this afternoon when Barry Cuda was playing and there wasn't an empty table to be had. Across the street is Paradise Pizza which advertises NYC type thin crust pizza so we went for that for an easy dinner given Ann's continued recovery. Actually, the pizza was quite good, better than I expected in Key West. 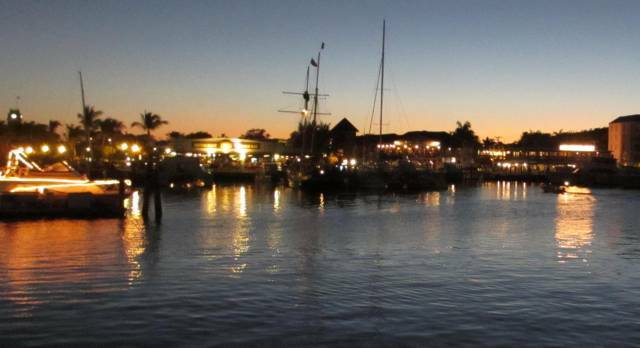 Now, there are just too many places in Key West to say that these are the top ones to see (don't forget Schooner Wharf Bar!! 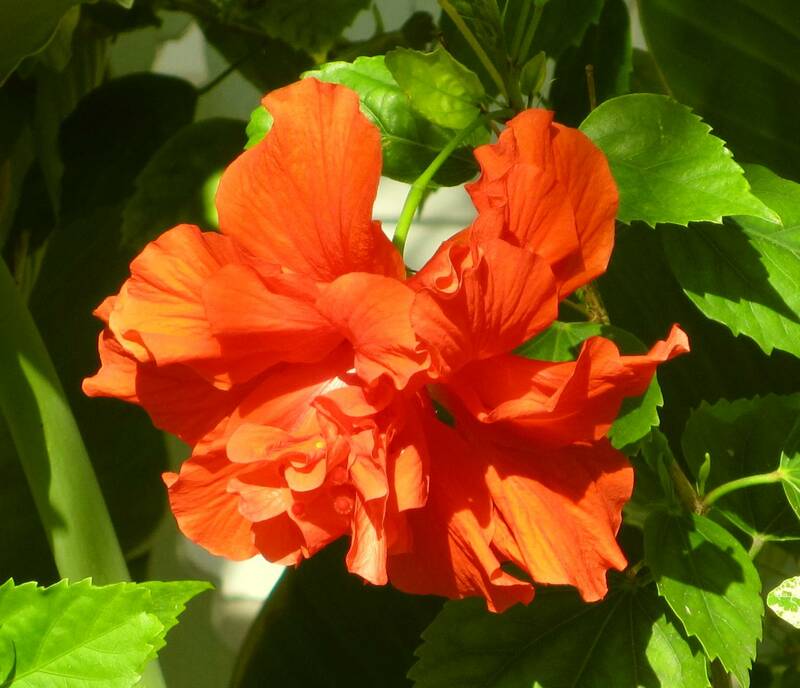 ), far from it - we are novices at seeing Key West, that's part of the fun, discovery - and there's no much more to discover! Another day of recovery for the crew of Fleetwing. I'm recovering but now Ann's under the weather with the same bug. So we just sat on the back of the boat and watched the world go by, not a bad past time in 78 degree weather in Key West. 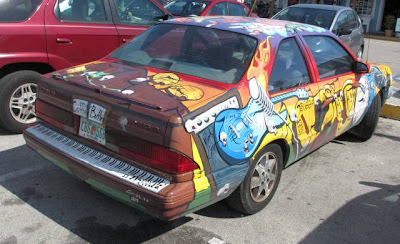 I walked Hoolie around this morning and noticed a number of Key West cars with unique paint jobs. 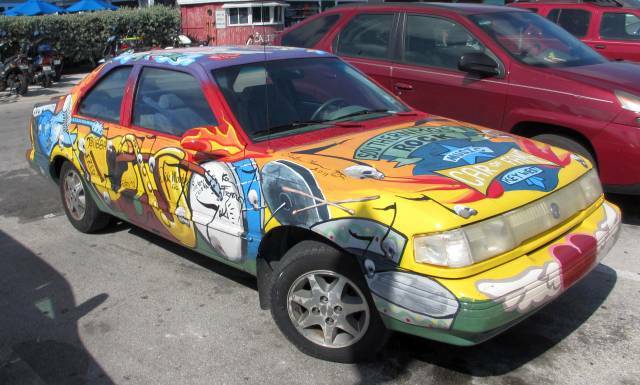 I guess they don't have to worry about rust so the paint stays fairly new looking except it does fade in the full Florida sun with time. When we took our kayak tour, the guide told us to be very careful of the grass bottom - not to disturb it. Sometimes you will see a soured path through grass where the props from a powerboat hit bottom in shallow water. The Coast Guard will levy a fine for such behavior that amounts to $500 per square foot of disturbed grass bottom (in protected areas as per the charts)!! If you're pounding along at 35 kts and wander off course, it could be an expensive experience! Most of Biscayne Bay falls into that category and also most of the stretch of water on either side of the ICW along the keys. We chose the Hawk Channel on the ocean side of the keys for our trip south for ease of mind. We're taking it day by day, hopefully we'll improve Thursday. We'd like to go by Sloppy Joe's if we can. We recovered from our colds enough for a walk down Duval street and we got as far as the Wyland Art Gallery. It's a great place to look around. There are sculptors of dolphins, octupi, and other creatures of the sea in amazing detail. 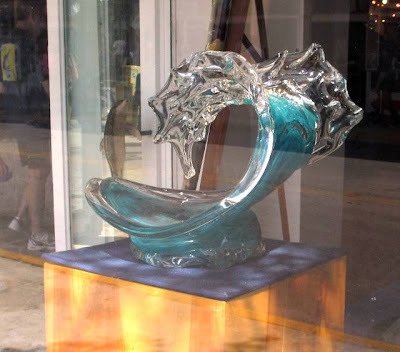 There are also glass sculptors of what appears to be waves frozen in time, very beautiful by David Wight. After being mesmerized by the paintings and sculptors, we moved on up Duval. 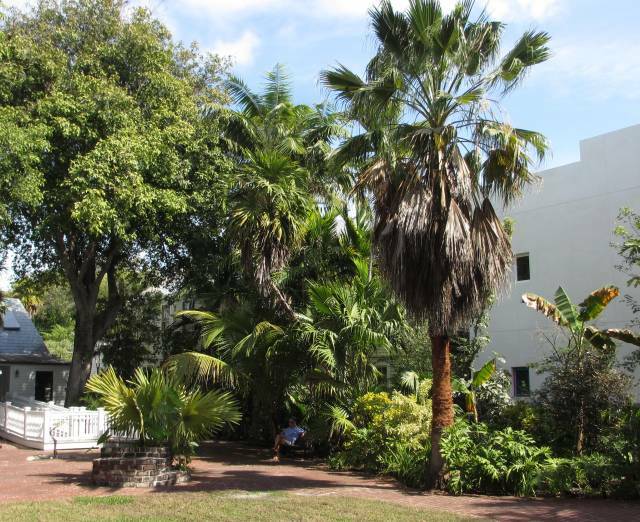 One of the oldest houses in Key West was moved to Duval Street and it open to the public we visited the gardens and rested a bit. It was moved to higher ground due to high tides (global warming?) around 1900. Having just recoved from a bad cold, we decided not to press our luck and returned to the boat and watch the boat traffic go by, relaxing. Oh yes, we did walk by Jimmy Buffett's place but didn't go in, very crowded. One member of the crew is not doing so well, namely the captain. I've picked up a northern bug and it's working its way through my system. As a consequence we're not getting out very much, just sticking around the boat and sipping cough medicine. So far (knock on wood) Ann has not caught it. 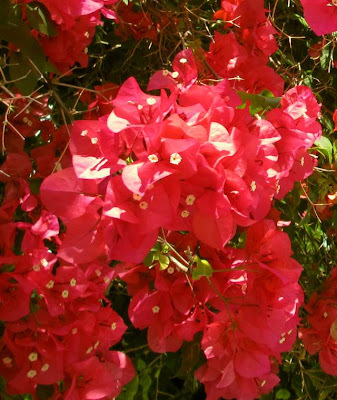 We did get out for a walk through nearby streets and admired the flowers and shrubs. There is always something in bloom and the residents seem intent on keeping nice landscaping around their houses. I've included a few photos but I don't know the names of all the flowers - but they do look pretty. 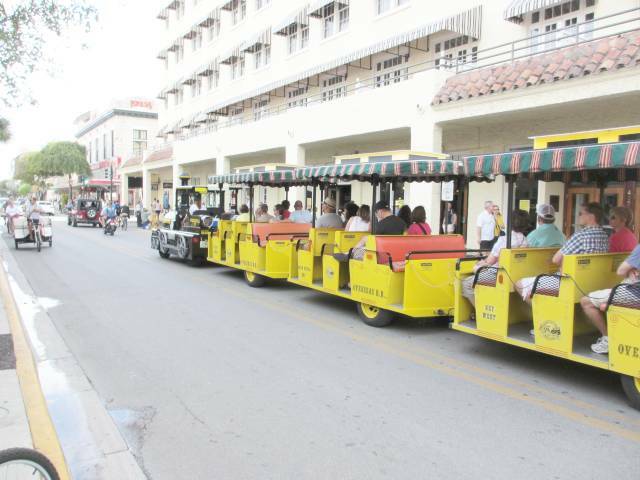 Meanwhile, Key West continues to be crowded. We're looking forward to seeing a few boats leave on Tuesday, we hope. On the dock we're on, there are still many empty slips so there is still room, even during the high season. The "Gene Machine" still blocks the entire southern horizon, oh well - everybody's entitled I guess. 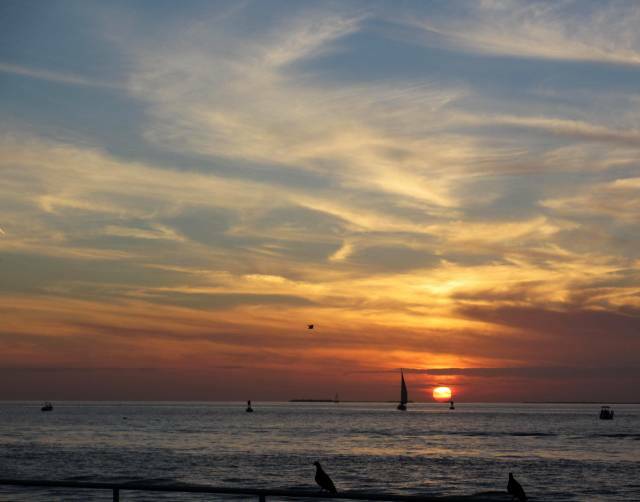 The temps rose to the mid-80's today, very hot for Key West. It's supposed to cool off on Monday to the low 70's for a high. We share the Key West Bight Harbor with the Key West Express. 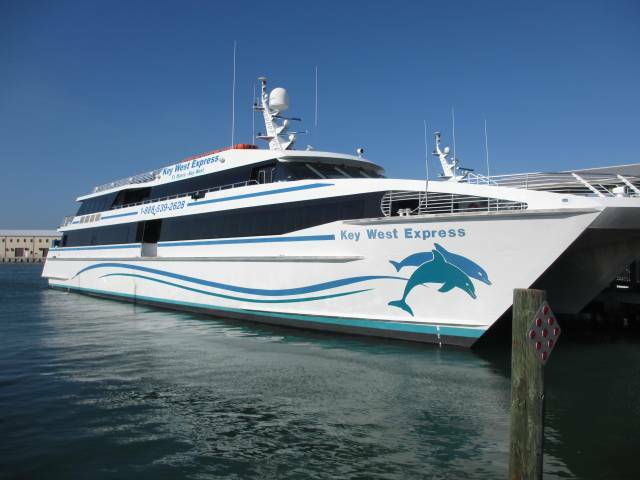 It's a high speed cat that connects Key West to Ft Myers on the Florida mainland. This time of the year it is always packed! So on addition to the cruise ships that dock sporadically by Mallory Square, we also have an influx of visitors using the Express. Needless to say, this is the high season but it's still before the avalanche of spring break crowds which start in earnest the first week in March. This past week was more crowded than usual since it conincided with Presidents' Week and many school kids had the week off. We figure things may settle down by the beginning of the week and we'll start looking for the places we haven't had the time to visit yet (so much to do, so little time...) Well, we still have 10 days left in paradise so it's not too bad. All good things come to an end and the crew's vacation was no exception. 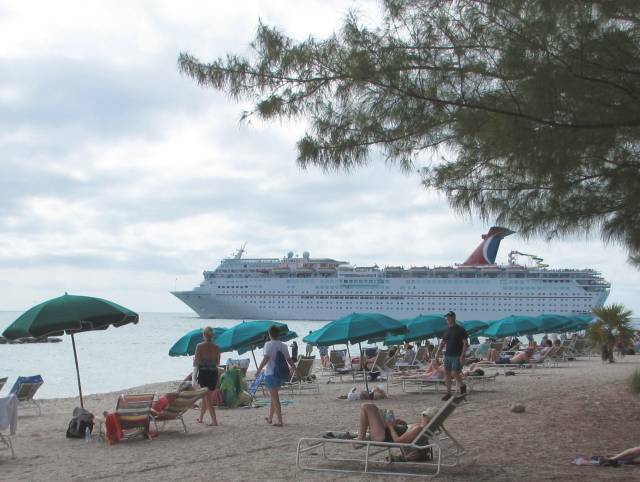 It was a great week with kayaks, two beach days, Cuban sandwiches, BO's Fish Wagon for piano playing with Barry Cuda, porch dining at A&B Lobster House, Mallory Square for sunset and a sail on Fleetwing - all in wonderful high 70's weather with no rain - what more to ask? We are now alone again so we rearranged the boat to our pleasure and refilled the water tanks. We did a major laundry today and some provisioning so we're set for awhile. We don't have to leave until 2/29, a Wednesday when our destination will be Newfound Harbor before continuing on to Marathon. Quite a few new boats came in today. Our view to the south is shaded by Gene Machine, a 130 ft motoryacht! 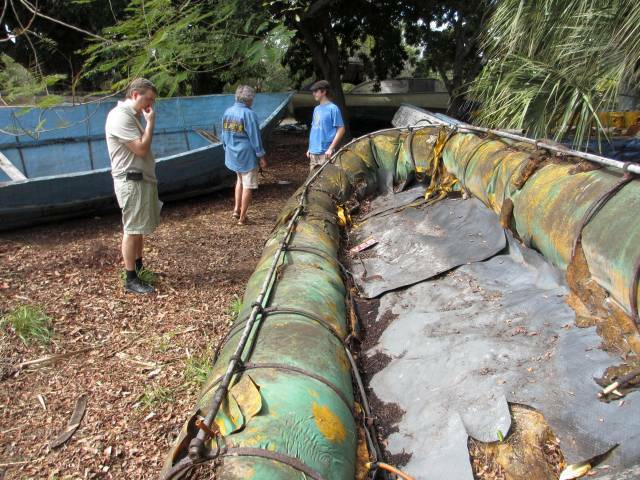 Their tender is about 30 ft long! I think we are starting to get into the spring break era with all the increase in crowds we've seen the last couple of days. Maybe it'll thin out again next week. We still have a few to dos yet: a session at Sloppy Joes, a visit to the Wyland Art Gallery and a couple more night outs for dining. 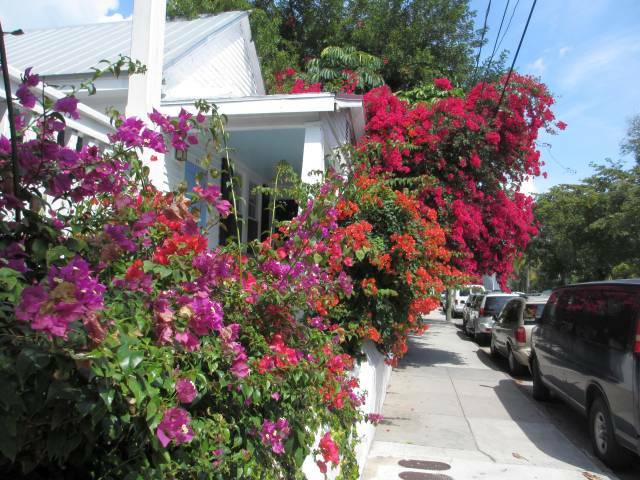 We certain enjoy Key West, I would recommend it for everyone. It was very warm today with not much wind so Philip and family headed for the beach at Ft Zachary Taylor. We were supposed to get a diver at noon to replace the zinc on our prop so we stayed behind intending to come along after he showed up. Unfortunately, he wasn't there by 1:30 even so as we were leaving we ran across him - supposedly he was on his way so we left the zinc on the aft deck and it was installed while we were away. Kind of reminds me of "island time" in getting things done which we ran into when in the Caribbean. Cuban Coffee Queen supplied the Cuban Sandwiches for lunch on the beach. 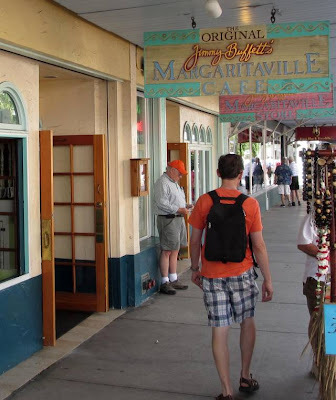 If you're ever in Key West be sure to sample the Cuban Mix sandwich, it's great. Next was a trip to Mallory Square for the sunset celebration. 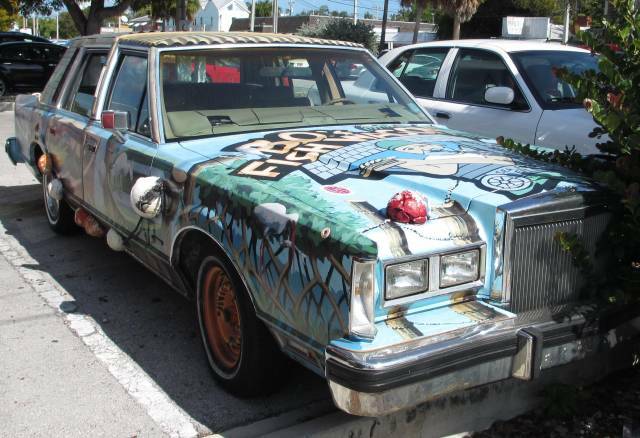 It's a unique part of the Key West experience. Sure, the sunset is great but what sets it apart are all the goings on while the sun goes down. There are entertainers spaced about every 100 ft or so, each with their speciality. There are fire breathers, monocycle riders (while juggling fiery sticks), tight rope walkers, human statues dressed as historical figures and others I don't remember. They all perform and ask for a tip at the end if you like their act. They all have a "patter" for the audience and are generally crowd pleasers, they have to be to earn a living. They don't get paid except for the tips. It's a real carnival atmosphere. I took a video of the Fire Eater. After the sunset, all the restaurants are packed! We had already eaten and walked back to BO's Fish Wagon to listen to Barry Cuda play the piano - Sara was interested in watching a good piano player since she's taking lessons. Saturday is the last day for the kids, they head north back to cold weather later in the day although I understand it's not all that cold back home, it's been a rather warm winter so far there. Hoolie had fun in the kayak! 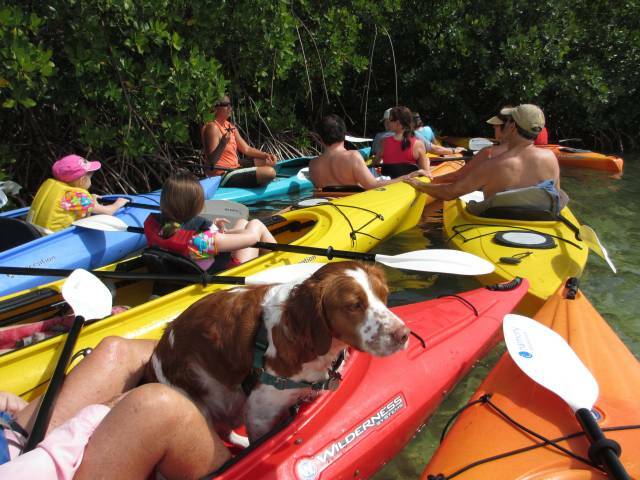 We decided to take a kayak tour in the back waters of Key West dominated by mangroves. We almost didn't do it since their website said the minimum age was 9 but when we called they said it was okay if the child sat in the kayak with an adult. As a matter of fact, it was also okay to bring your dog! With that Ann brought Hoolie! We arrived at Lazy Dog Kayaks around 12:30 to get ready for the 1:00 pm, 2 hour tour. There were about 15 or so kayaks ready for the tour. They advertised the trip as non-strenuous but I think it's a little more than that since we had to paddle out against the wind and current! Of course the trip back was great and by that time we were ready for a rest! They had rest stops along the way where the guide explained the local waters and the creatures in it. All along it was very shallow. We had lifevests but you could have stood up anywhere along the route although the bottom was very muddy. When Ann got in the kayak with Hoolie, there was a bet made unknown to us that one of them would return wet! Well, the guy didn't collect, both Ann and Hoolie were dry although Hoolie was very interested in all the goings on around him but he remained in the kayak! 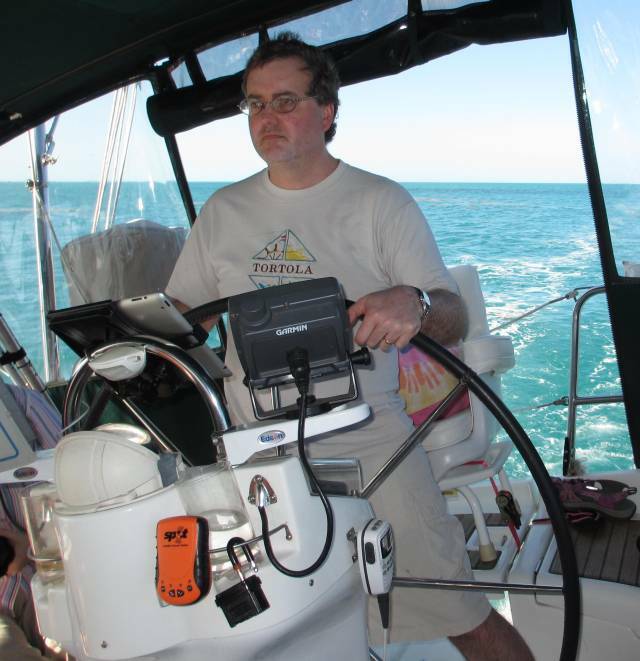 Philip at the helm, good wind! It was a perfect day for a sail with winds out of the southeast at 10 to 15 kts, full sun, no chance of rain or thunderstorms and very little waves. So we headed out around 11:00 to the reefs but we had a crew member who didn't fare very well in the chop we encountered so we turned back to sail west of Sunset Key (otherwise known as Tank Island on the charts). It's a protected area from waves so we had flat water to sail in. Our youngest crew member recovered well enough to put away a good lunch! This is also the area where the party boats go since the water is protected with little chance of seasickness among the passengers. So we saw the parasail boats, a couple of windjammers, several sea adventure boats, several Coast Guard boats looking for Cuban Chugs - lots of activity. If you want to see a video of sailing on Fleetwing, click here. On the way back we crossed in front of the windjammer Appledore and then turned to chase her. The windjammers don't go all that fast, even with all their sails up and we caught up after 20 minutes or so. This was the same experience we had when we sailed in Maine, They look beautiful but slower than us. Coming back into our slip is always exciting. One crew member is posted up front to catch a dock cleat, two on either side to catch both pilings to keep us from hitting the front dock and I try to maneuver the boat between the pilings without too much damage. For the most part we were successful. 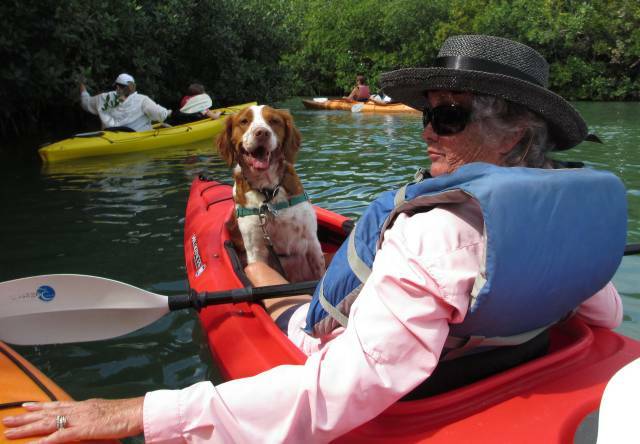 We have plans Thursday to take a kayak trip on the back side of Key West in shallow water and Ann even wants to take Hoolie! 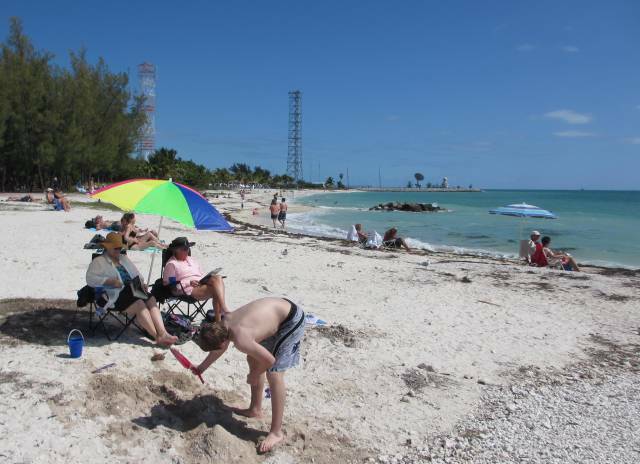 There is a very nice beach on the south shore of Key West at the Fort Zachary Taylor State Park. With the warmer weather it was a beach day! It's a hike to get down there so we took the minivan and parked right at the beach. There's a small charge for a car full, around $8, not bad. 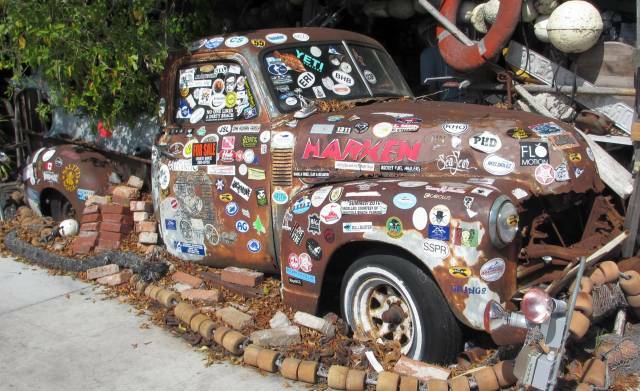 No room to spare - looks very close to the beach! The section of the beach that we go to has a small seawall arching out into the ocean that provides a protected play area for the little ones. Since Key West beaches are all protected by the outlying reefs, there is no natural sand production. The sand for many of the beaches has been imported from the Bahamas. Regardless, it's a great spot to spend the day. 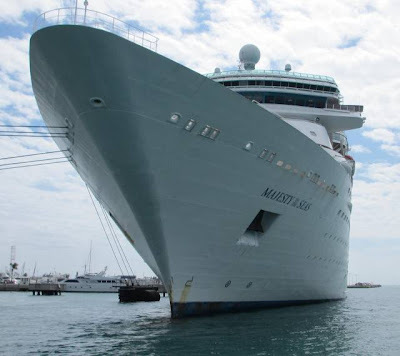 It's located at the southwestern part of Key West, next to the entrance channel so you can see all the ship traffic, especially the large cruise ships coming and going. They just barely fit in the channel, no room to spare! Sand and water is always good entertainment for kids so it was an easy day for the adults. On Tuesday we're headed for a sail on Fleetwing if the weather cooperates and we'll do another check on that troublesome engine temperature. Key West has its own Tropical Forest & Botanical Gardens so today we explored the area. 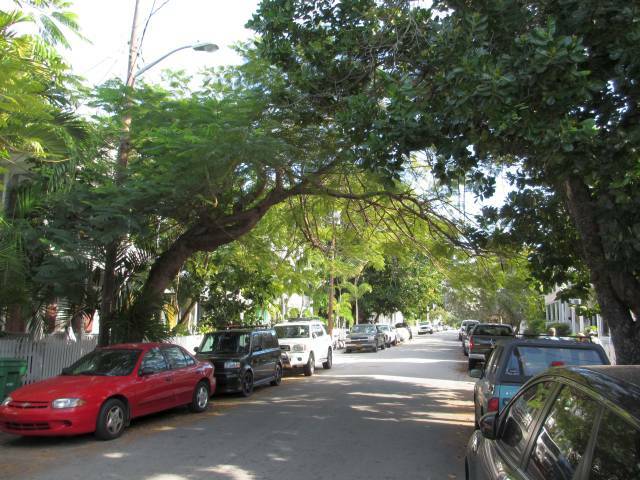 It's an oasis of greenery in the middle of civilization. It used to be municipal buildings for the town of Key West but they discovered that it was sitting on a "fresh water lens" which was just a few feet below the surface. The term refers to the way rain water collects in the porous ground and forms a shallow, fresh water source over the top of salt water underneath. The fresh water, being lighter than salt water, floats on top of the heavier salt water. 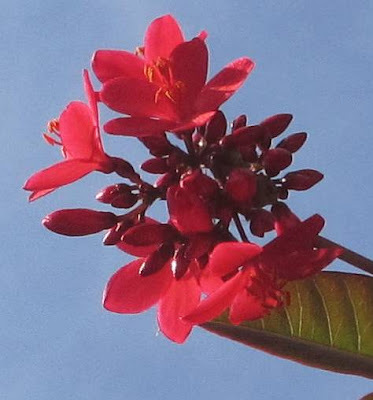 After this discovery, the area was cleared of all buildings and returned to the way it was 100 years ago and replanted with native varieties. In the preserve, it's possible to pretend you're out in the wilderness since your views are screened from the nearby parking lots and playgrounds. 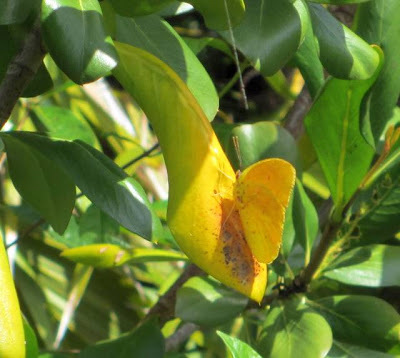 It's now a haven for local birds, insects such as butterflies and small animals. The entrance fee is only $5, a bargain and it's a nice nature walk for both adults and kids. Along the way we saw turtles sunning themselves, many butterflies of all kinds, lots of ducks and a great variety of palm trees as we walked through the shaded path, very pretty. At one spot they had musical xylophones set up and the kids had a great time making use of them! Throughout all this there were no mosquitoes or noseeums, not one. 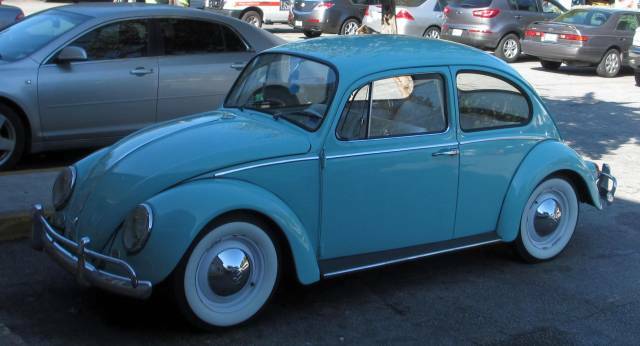 Want to cross the Gulf Stream in one of these? At the end of the walk they had a display of "Cuban Chugs" which are the water going "vehicles" used by Cubans to escape Cuba on the way to the Florida. Thinking of being in any of them for 90 miles of open ocean is pretty scary! Of course, the exhibit only had the Cuban Chugs that successfully made the trip!! Who knows what sank? The weather is turning warmer and I'm sure we'll hit the beach Tuesday! The captain stands on the platform over the motor and pushes the boat with a stick, shallow water fishing! In order to get a good price on the airplane tickets, Philip and family flew out of Newburgh, NY. They live near Hartford, Connecticut but the fares offered by Jet Blue for a direct flight to Fort Lauderdale could not be beat (around $200 round trip, leaving at 2:00 pm). 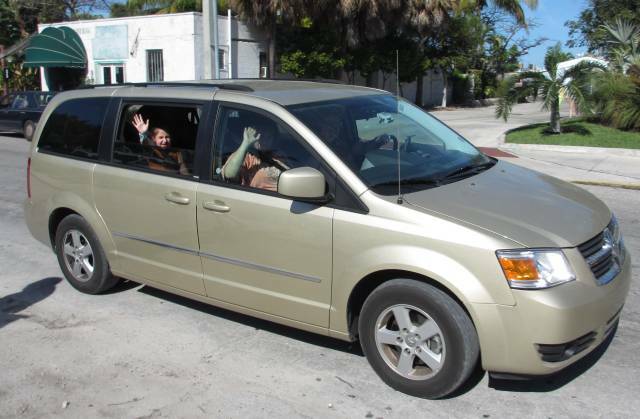 They rented a car for the final leg to Key West and arrived around 10:00 pm. Unfortunately, they arrived in the midst of a cool spell with temps only in the mid 60's but they thought it was warm! 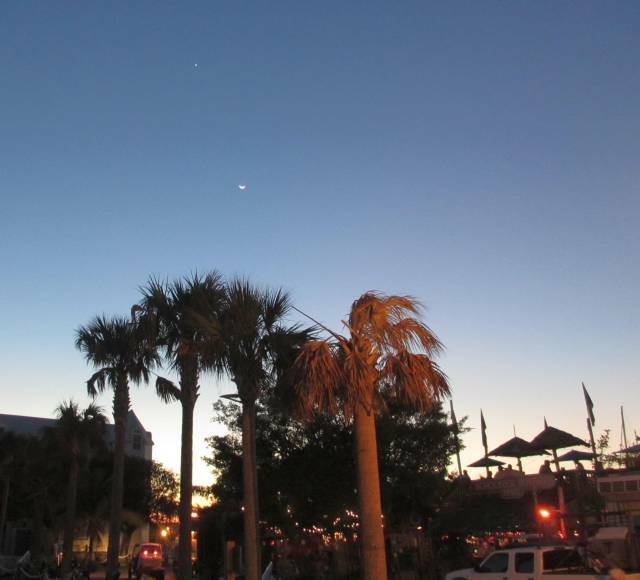 For the rest of the week, temperatures are slated to return to the normal range of high 70's. Today was spent provisioning, no beach time today - given the 20 to 25 kt winds and 60's temps! The locals were out in the usual uniform of the day for any temperatures below 70, namely a hooded sweatshirt drawn tightly around the face showing only eyes, nose and mouth (no chin, no hair) with long pants. Of course the tourists were all out in shorts and tee shirts, especially the Canadians. Still, the windjammers did not have their full compliment of passengers today, it would have been much colder on the water. Monday hopes to be a better day, perhaps even a beach day if it warms up enough. Last year when we home schooled Matthew for two months when he came down the ICW with us after Christmas, his whole family came down to ensure he made the trip back! They enjoyed the time in Key West in February so much that this year, without prompting, they bought tickets to fly down for a week during their winter break for a little warm weather. They left the wintry northeast at 2:00 pm today and just landed today at 5:00 pm, welcome to warmer climes! A sight you don't want to see coming at you on the water!! So today was spent getting the boat ready for the invasion, two adults and three grandkids for a week. Except for Sunday when the temperature is only to reach 65F, the weather will be great with highs in the upper 70's. At the moment we are getting terrific winds out of the north, 20 to 25 knots with the temperature dropping to 70! It hasn't put much of a damper on Key West festivities as far as I can tell, the bands still play, the people still gather to listen, etc. I'm sure we'll have lots of beach time over the next few days, time for a change of pace on the boat! The dog never stirred! She carried water on her belt. Vic and Harela gave us a call a few days ago to get together while in Key West. They're from Chelsea YC on the Hudson River just south of the Poughkeepsie YC, our home base. They also came down the ICW in their sailboat but with a bit more of a challenge since it draws 6 ft (I draw 4 ft 9 in). 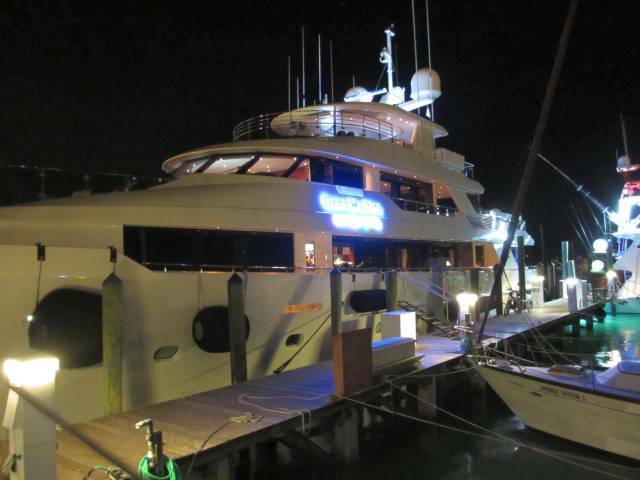 Nevertheless, they made it down and are in the Key West Harbor YC on Stock Island, the next island east of Key West. Ann made lunch for all of us and we traded sailing stories - as sailors always do when they get together. 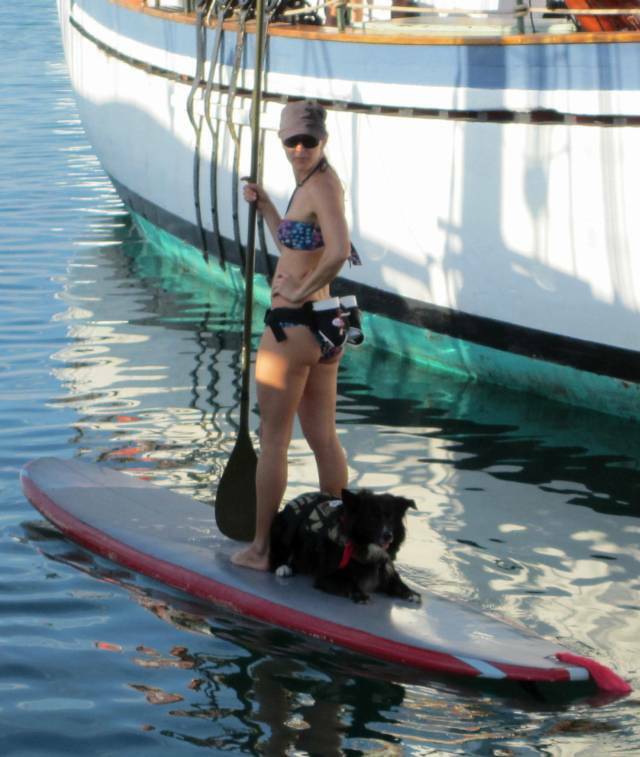 That afternoon we saw our first paddle boarders in Key West. They launched between two windjammers and paddled out into the harbor. 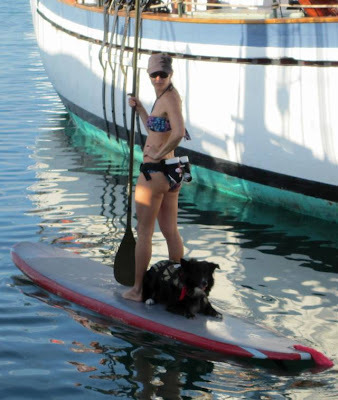 The one in the lead even had a dog that laid down on the board very calmly as she paddled along. I can't picture Hoolie being that calm. We would both wind up in the water the first time he saw another dog or a bird got too close! 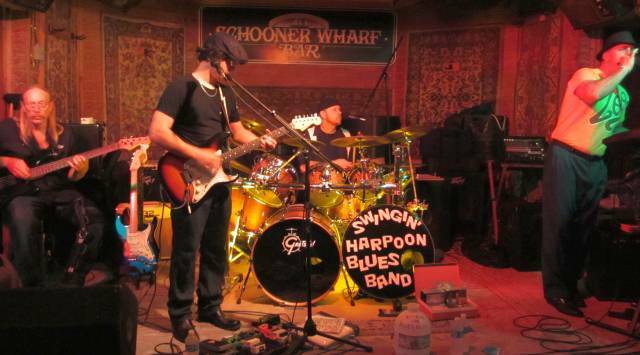 Schooner Wharf Bar had a four piece band that we wanted to listen to and so we took Hoolie over with us and claimed a table in the corner. We were not alone in having a dog, there were at least a dozen scattered under the tables. The band I thought was very good, the best we've heard so far. I would be interested in hearing what Mike thought of the drummer. I took a one minute video of one of their sessions, click on Harpoon Blues Band for the video.